Traditonal risotto is made using arborio rice, which is white and glutinous and produces a very creamy rice dish. 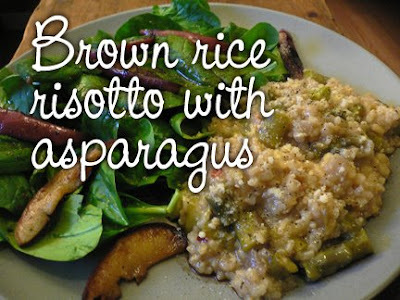 The trick to making a creamy and tasty brown rice risotto is to use short grain rice and lots of veggie stock. Pictured here with a spinach salad topped with sauteed apples. In a medium, heavy pot, heat the butter and olive oil. Add onions, garlic and red pepper flakes, sauteeing until soft. Stir in rice, basil and half the stock. Let simmer covered on medium for 20 minutes, then add remaining stock plus asparagus. Stir well, cover, and let cook until all the liquid is absorbed and rice is creamy (not firm or dry), about another half hour. If needed, cook in another 1/4 cup or 1/2 cup of stock to reach the right consistency. Stir in parmesan to taste and grind in some black pepper. Serves 2. Great for all doshas. Pittas, omit or minimize garlic, dride basil, and red pepper flakes; Kaphas, omit or reduce butter and oil to 1 tsp each. hi, can i use jasmine rice instead of the brown rice for this risotto? Hi Senhal! I'm sure you can use any rice you like, though for a creamier dish it's best to use short grain rice (short grain brown rice is healthiest, short grain white rice is traditional risotto rice, and anything else would be a risotto-like rice dish which is fine too!). Let us know how it worked out for you! just a note, if you can find cheese made from raw milk, or use goat cheese, these are easier to digest! Hello All!! I am new to the site and am very anxious to try a new & healthy outlook on life! I will try this recipe 2nite!